There have been lots of changes at the Huffington Post’s education page over the past year or so, but if you’re not paying attention to the stories it puts out every day you might be missing out on good material.HuffPost isn’t breaking news or doing much event coverage any more, but it’s still finding ways and places to engage readers and provide useful information about schools. Launched way back in 2010 — remember? — the HuffPost education page has been through several iterations and staffing configurations. But education page editor Rebecca Klein (pictured) has found ways to keep the page fresh and do some of her own reporting. She’s been at the Huffington Post about three years, covering education for the last two and a half of them. “Basically what my job is to write reported pieces, run the social media channel, and act as gatekeeper for pieces that bloggers send me,” Klein told me in a recent phone interview. Lately, there’s a big push at Huffington Post to focus on things that are working — the site’s “What’s Working Initiative” — based in part on the work that the site has been doing with the Solutions Journalism Network. For education, that means efforts to close the achievement gap, reduce the discipline gap, and address other obvious problems in schools. But the effort is not funded by the Gates Foundation or anyone else. It hasn’t been easy since Resmovits left, but in some ways the Spencer Fellowship year helped ease the transition. And, according to Klein, HuffPost’s commitment to education is strong enough to insulate the page from pageview pressures that have led some journalists and outlets into covering stories based on how much traffic they get rather than how important. It also helps that HuffPost’s big rival, BuzzFeed, has an education reporter who focuses on higher education and the business side of schools rather than K-12 issues. 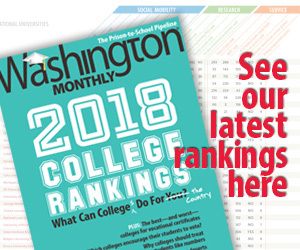 The page’s real competition may be the Washington Post, which features a handful of education reporters and an abundance of commentary curated by Valerie Strauss. You can find the HuffPost education page here. You can find Klein’s bylined work here. She tweets at @rklein90. Related posts: Huffington Post Hires New Education Reporter; Huffington Post Education Reporter Heading … West? ; High Hopes & Expectations For The LA Times.